I love Bonnie Hunter's Leaders & Enders challenges. This year the project is "tumblers." I'm using my Civil War reproduction scraps in an attempt to use them up. Before I came to Texas this summer, I cut most of my CWR scraps into tumbler shapes. The tumblers filled one of my cute metal lunch boxes. I thought that would be enough to last me though fall. Even though I have a good-sized bin of Civil War repros, I had to beg more background fabric from my friend in Ohio. Thanks, D'Awn! Faith didn't like the block with Abraham Lincoln (upper left in photo) appearing upside down, so I flipped this photo. The rows aren't sewn together yet, so if it looks like the tumblers don't match up -- they don't! 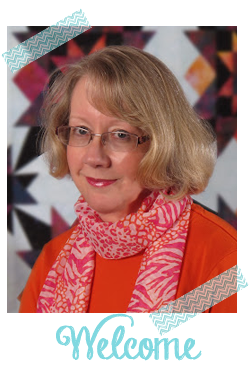 Bonnie explains that "Leaders & Enders" take the place of the scraps of fabric many quilters sew onto at the end of a row of stitching. Rather than using scraps that you'll throw away, why not sew together pre-cut shapes. 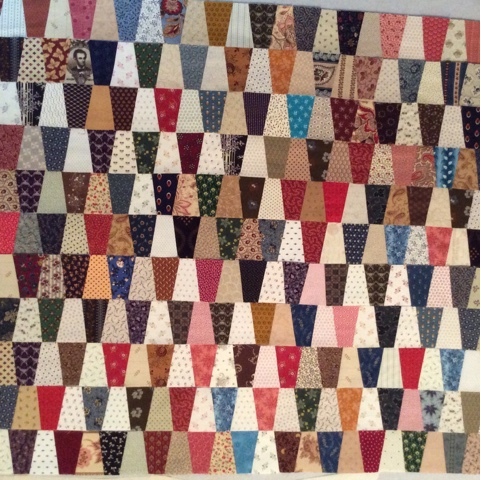 I've used 2.5" squares and the cut-off triangles from snowball blocks or flying geese. My tumblers are cut from 3.5" strips using the EZ Dresden Tool from Darlene Zimmerman. The narrow end of each tumbler is at the 2.5" line on the template. I calculated to make my "tumblers" quilt a large lap-size, I need to make 30 rows of 33 tumblers each. Do you use "Leaders & Enders?" Are you making this quilt, too? I love leaders and Enders--makes me feel so productive! But an definitely not making the tumblers quilt; not my style. I used the twin sister block as a leader and ender at first then I decided I had to move it up to the main sewing in time to give it is person. So what started as a leader and ender ended up as a September finish! I've been doing leaders and enders for a few years now - all my bits get cut into 2.5" squares and I join them into long strips - aout 40" long and join those long strips to a single strip in beween - (takes away the fussiness of matching seams when I'm trying to do something quick) and eventually I hope top turm them into some laps quilts for an aged care facility.